I have four wings and my wingspan in certain species can be up to 7 inches long. I have a long thin abdomen. I am quite harmless and will not sting, attack or bite. As a larva, I eat tadpoles or small fish. As an adult I will eat other small insects, primarily mosquitoes, and I am considered useful for controlling the mosquito population. 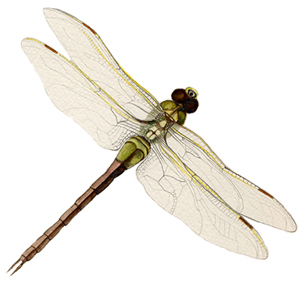 Dragonflies are carnivorous in both larval and adult stages. I am most often found near water and usually remain within a few miles of the place where my egg was hatched. I go through three stages of development: egg, naiad (larval) and adult. My egg is laid in water and I typically hatch in two to three weeks. In my larval stage I am called a naiad. I live in the water and use internal gills to breath. I can live in the water as a naiad for two to three years. When I am ready to become an adult I crawl out of the water and shed my skin. As an adult, I can live for over a year if I migrate away from the cold.